Speed Dodge is a free car game for Windows 8 and 8.1 in which your car automatically accelerates at a high speed and the aim is to go the highest distance possible. 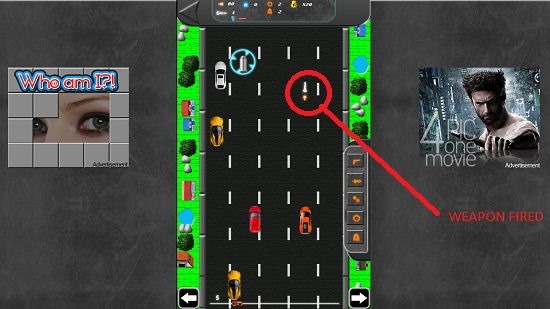 You have to dodge the traffic and other racers by steering using the left and right arrow keys. 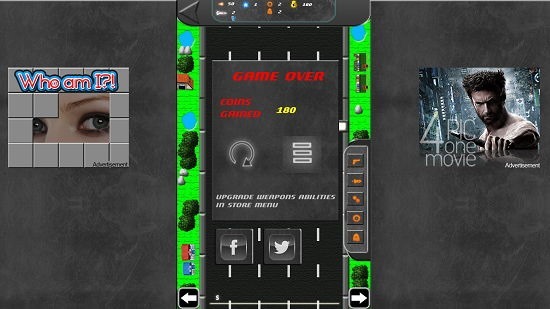 The game has an interactive background track and also has weapon abilities which allow you to fire weapons that can destroy the traffic or enemy vehicles. Some examples of weapons included with your car include missiles, gun, force field etc. all of which can be activated by clicking on their respective icons at the right side of the screen. Speed Dodge is available for free from the Windows App Store. 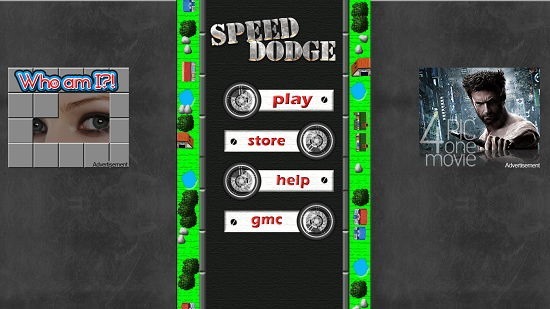 When you install and run Speed Dodge on your device you will be presented with its main menu right off the bat which looks like the screenshot shown below. You can directly start the gameplay by clicking on the Play button in the main menu. Once you have clicked it, you will be presented with the level selection screen of the game. 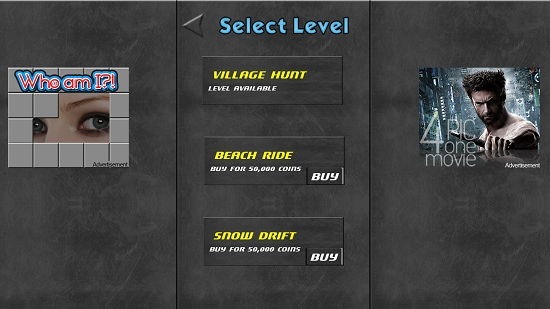 The game allows you to choose the level via an interactive menu which is shown in the screenshot below. Upon choosing the level that you wish to play, you will be taken to the gameplay screen itself. The screenshot below shows the car as well as a missile being fired as a demonstration of the weapon capabilities of the car in the game. You can see the missile fired from the car in the above screenshot circled in red. You control the orange car. The game also has onscreen controls in case you are playing on a touch screen device which allow you to toggle the steering controls of the car. You can fire weapons via the control icons to do the same at the right side of the screen. If you look closely, you can see icons of guns, missiles, force field etc. all of which will give you an edge and allow you to go a greater distance without crashing. You can see your score and other stats at the top of the screen. Once you crash, it’s game over and you will be shown your stats as can be seen in the screenshot below. This wraps up the main features of Speed Dodge for Windows 8 and 8.1 devices. Speed Dodge is a well-designed game for Windows 8 and 8.1 which makes for a great download on devices running Windows 8 and 8.1. You can get it from the link below.